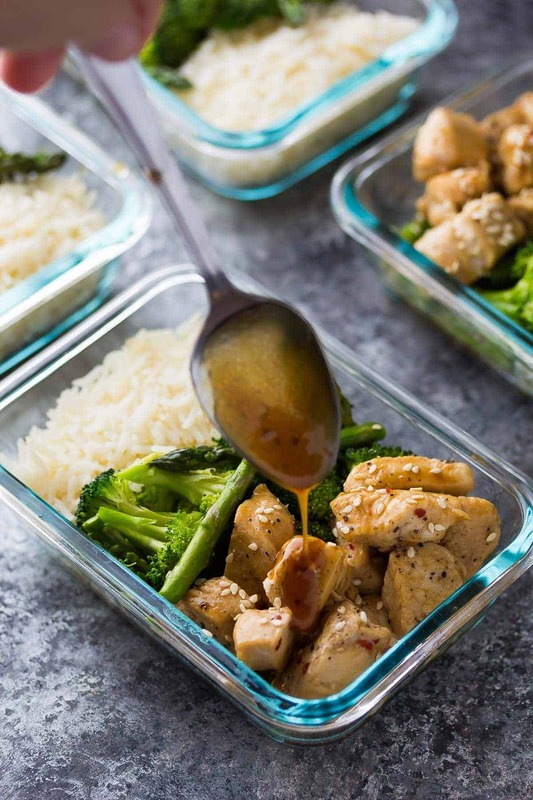 These Honey Sesame Chicken Lunch Bowls have chicken breast, broccoli and asparagus tossed in a sweet and savory honey sesame stir fry sauce. 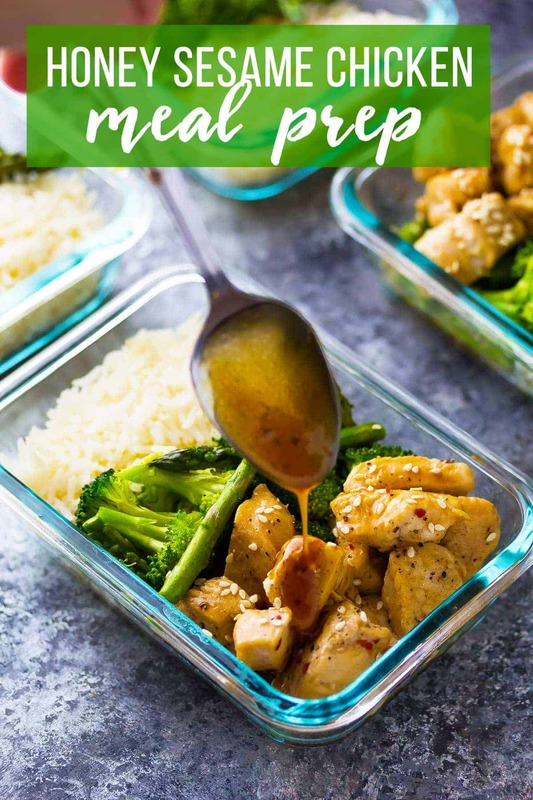 Perfect for healthy meal prep lunches! For more stir fry sauce ideas, check out this post with SEVEN different stir fry sauces that you can make ahead and freeze! Can I tell you a secret? I’m not an organized person. I know you see all these meal prep breakfasts and make ahead lunch bowls and maybe some neatly stacked containers of chicken fajita lunch bowls and you think ‘wow, that Denise? She’s organized!’. The truth? I’m so not organized. I mean, my bag is still not unpacked from travelling last week! The recipes that you see on the blog are a product of my disorganization. This is me, trying to overcome my disorganization. And I hope you don’t mind: I’m bringing you along for the ride! Can I tell you another secret? 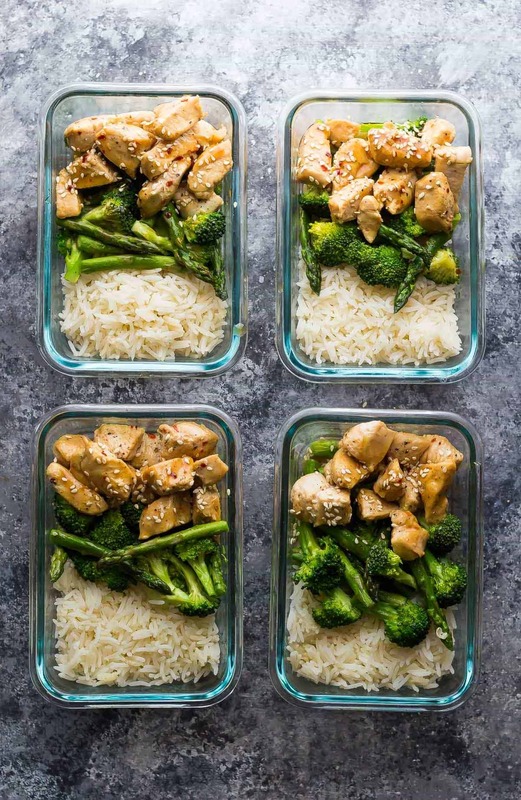 Today’s honey sesame chicken lunch bowls are actually just a stir fry, divided into four containers. I’m pretty sure you figured that out already, but just so we’re on the same page (wink wink). I’ve already posted lots of salad-type lunch bowls…such as these chicken fajita lunch bowls, and these Mediterranean farro chicken lunch bowls. I thought it was time to mix it up a bit. Guess what? 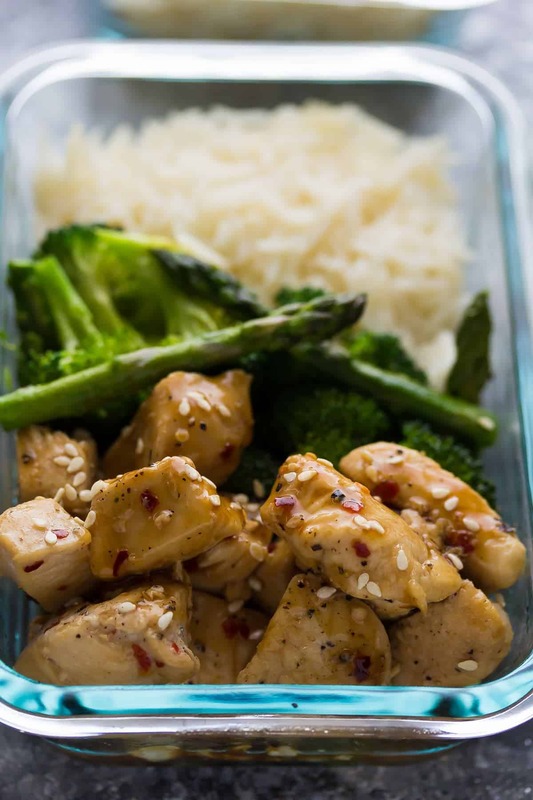 These honey sesame chicken lunch bowls can be ready in under 30 minutes. Just think about this: 30 minutes effort to ensure that you’ll have a healthy, filling lunch waiting for you for FOUR days. Doesn’t that sound awesome? It is. Note: on day four, your broccoli is not going to smell like roses, but it still tastes delicious! Swap it for carrots, bell peppers or zucchini. How it all goes down: cook your rice. Shake together your sauce. 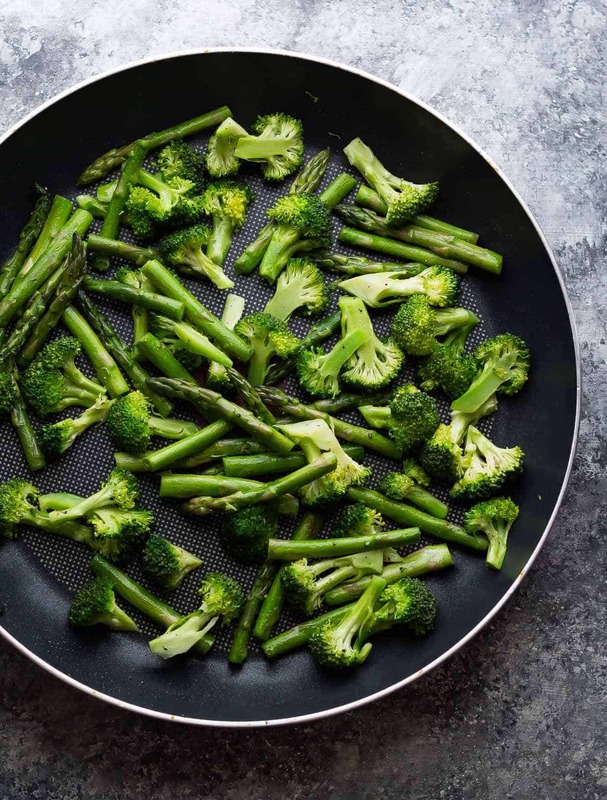 Cook your veggies. Then cook your chicken. Toss chicken in sauce and cook until it thickens slightly. Take a picture and post it on your social media. Let people assume that you have your life together. The end. More meal prep work lunches for us! These Thai Chicken Lunch Bowls have a creamy dreamy peanut sauce! Shake together all honey sesame sauce ingredients and set aside. Cook rice according to package instructions. Divide between 4 storage containers. Heat olive oil in a large pan. Add broccoli and snap peas. Cook for 5 or so minutes, until bright green and tender. Add to the rice in the storage containers. Add additional olive oil if necessary. Add the chicken to the pan. Season with salt and pepper, and red pepper flakes (if desired). Cook for 7 or so minutes, until cooked through. Add the sauce to the pan and simmer for 2 minutes, until thickened. Add the chicken to the lunch containers and drizzle with sauce. Garnish with sesame seeds if desired. Store in the fridge for up to 4 days. Reheat to serve. This recipe is mildly spicy. Feel free to reduce or leave out the red pepper flakes for a less/non-spicy version. Ummm you can only safely keep cooked rice in the fridge for 3 days. Less if you don’t get it in the fridge quickly. Janis it depends on which source you look at. This one, which pulls its data from the US FDA clearly states 4-6 days. Cool your rice as quickly as possible and reheat to steaming hot and you should be perfectly safe. But you do you and if you don’t feel comfortable with 4 day storage, then go ahead and move on to another recipe. I doubled this recipe thinking it would make 8 meals. Didn’t realize how tiny the containers were that were used here. My 8 meals is basically 4. Hoping it takes just as good as it smells! Might be a bit hangry this week though! The portions I use are what are in line with what is recommended for daily caloric intake. 1/2 cup rice, 4 oz chicken and 1.5 cups veggies is a pretty good sized portion for most people. Sorry you found it small. I know this is a strange question but how much did the “2 large chicken breast” weigh? This looks awesome. Going to give this ago. Thank you for posting! Do you have instructions on how to reheat thie? Hi Alexandra! Just heat in the microwave until it’s steaming hot. Hope you enjoy! This is my second recipe of yours that I’ve tried. I’m really enjoying these balanced, easy meals. This one is delicious as is. I added some toasted cashews on top for a crunch and subbed carrots for snap peas. Next time, I’d like to add a little onion and eggplant to the sauteed veggies. Yummy! I love your swap ideas! Thank you for sharing the honey-sesame Chicken recipe! Prepped it as is and was an excellent addition to my meal prep game plan! I paired it with brown rice and curried cauliflower… Delish!! I’m so happy you enjoyed! Thanks so much for taking the time to leave a review, Anu! Hi! Are you able to freeze this and heat later? Hi! My name is Renata and I am brazillian. I think it is difficult for me to prep because I do not have any idea how much of the ingredients I should buy as much as possible. For example, this recipes asks for 1 cup of brocolli. So, how much should I buy or unfreeze to prepare this recipe without leftover? It would be easier if everything was in grams or ounces / pounds (I dont know the measure system of USA). I know that this probably isn’t the focus of this website, since I am a foreigner, but … could you recommend another site or maybe a way to solve my problem? Sorry for my bad english and thank you! I really loved the site. Hi! My name is Renata and I am brazillian. I think it is difficult for me to meal prep because I don’t have idea of how much of ingredients I should buy to loose as minimal as possible. For example, this recipes asks for 1 cup of brocolli. So, how much should I buy or unfreeze to prepare this recipe without leftover? It would be easier if everything was in grams or ounces / pounds (I dont know the measure system of USA). Sorry for my bad english and thank you! Hi Renata! Unfortunately that is not a common way for us to measure here in Canada…I do try to weigh ingredients whenever I’m baking but for cooking I am really just estimating in cups, and I don’t know what it works out to in weights. You might have better luck with European-based blogs as they will weigh their ingredients out and don’t use cups to measure. I hope this helps! I live in Brazi too! . An American cup measurement is about one teacup. A medium/large head of broccoli from the market is about 4 cups. You do get used to the amounts and what they should look like over time! I’ve tried websites to convert but one cup is a different weight for every type of food so I’ve never managed to do it that way. 1 cup is about 250 mL. Hope that helps! Hi Sue, that information is right on the recipe card…is it not displaying for you? Can you do cauliflower rice? I use it just because it’s less calories and don’t really see a huge difference in taste! This recipe is AMAZING! added a bit to much soy so my end result was very strong in soy sauce but other than that being my own fault it’s INCREDIBLE! Can’t wait to have this amazing meal for lunch for the next few days :D! So happy you enjoyed it Tyla! Made this over the weekend and was feeling unsure going into lunch today as my last few attempts at meal prepping have been average at best. However, this was great! A few people told me it smelled amazing and it tasted just as good as it smelled. Even better, it was very filling. This is definitely a keeper for me, easy prep and a delicious meal. instead of using broccoli can i use carrots? do i cook them the same way as the broccoli? Hi Brianna! You can absolutely sub the carrots for broccoli. I think they’d cook for a similar time, depending on how you cut the carrots 🙂 Hope you enjoy! I made these the other day and am just now enjoying one for lunch. The flavor is awesome and my husband approved! So glad you’re enjoying your lunches this week, Mary! This looks greats looking to try this for work next week as lunch just a bit confused by the cup measurements? Is there anything I can use instead of cups to measure the ingredients? Just ate this for lunch today. So delicious!!! pretty easy to make too. I just did some frozen veggies I had in the freezer, still worked great. Thanks for the recipe! So happy you liked it Christy! Hi, where can I find that sauce shaker or something similar? Thanks! I have heard that heating olive oil can make it a carcinogen. Any thoughts on that? Hi Neha! I used the 2 cup snapware containers (these ones). They put the price up on Amazon but I’ve heard they’re a great deal at Walmart! I am just wondering do I need to reheat each day or can it be eaten cold? Hi Lawren, they are heated up like a stir fry 🙂 I hope you enjoy them! I am trying to not eat rice or pasta… what do you suggest in place of that? I made these for lunch this week and they are delish! Thanks for such a great recipe! Hey this looks delicious was just wondering about the chicken. If I used already cooked frozen chicken is it safe to reheat it again to make the meal and then reheat when eating? Or would you say it’s better to use fresh chicken? Hi Naomi! I haven’t tried making this particular dish with already cooked/frozen chicken, but I have frozen lots of my slow cooker chicken recipes after cooking and they seem to keep well in the fridge after thawing. I can’t find any official food safety information about this though…so if you are nervous, go for the fresh chicken instead. do you store the chicken in the fridge or the freezer? Hi Natalie! I store the whole thing assembled with the sauce and everything in the fridge. I haven’t frozen them as I don’t enjoy freeze/thawed rice. The ads on this sight make it impossible to navigate. Laura, can you tell me if you’re on mobile or desktop? Hi Maxine, I’m sorry I have no idea of what “1R 1Y 1-2 G and 2tsp” means? Could you please clarify? The R, Y, G and tsp are 21 Day Fix container counts. My wife and I just made this dish and it was delicious!!! We will definitely keep this as an easy go to recipe. I’m following the SlimFast Plan (2 shakes, up to 3 100-calorie snacks, and 1 healthy 500-calorie meal per day), and these bowls are perfect–tasty, filling, and easy! I now have dinner for the next four nights. Thanks so much! Made this today and it was absolutely amazing! Added a red pepper for part of the broccoli and peas and used brown rice but didn’t change anything else. I could have split the recipe into 6 and would have had plenty. I am trying freezing the other 3 bowls so we will see. I will definitely make this again! Going to try this tomorrow !!! A great alternative for soy sauce is liquid aminos…I made this today and swapped the soy sauce for liquid aminos, which a great, healthier alternative. I definitely want to try this 🙂 Thanks Jessica! Just made this tonight. Watch out for salt levels. Used low sodium broth and soy but might have overseasoned a bit. I would say leave it off the chicken since you can always add. Super excited for lunch this week. Thanks Adam! We use low sodium soy sauce but didn’t find it too salty. But definitely add the sauce to taste. These look delicious! When having them for lunch, do you reheat everything in the same tub in the microwave? Or eat cold? Thanks! Hi Emma! Yes, I re-heat the whole portion in the microwave. How long do you microwave it for? Hi Miranda, that’s going to depend a lot on the microwave you’re using, since they all seem to have different strengths. I put mine on 80% and give it 1:30 (with the lid ajar), and that works well in my microwave. Where do I find the small glass dishes? These snapware pyrex dishes are my absolute favorites: http://amzn.to/2iUOJ5t I found mine at Canadian Superstore but Amazon carries them too. Do you use the 2 cup size pyrex dish for this lunch bowl? Just saw this! Sounds very good. Thankyou, I’m going to try this in the next couple days! I like easy simply recipes for 2 people! I hope you like them, Marie! Looks delish! Do you think these would be ok to freeze to last over a couple of weeks? Hi Lauren! I’ve never tried freezing this, actually I’ve never had much luck at freezing rice. If you try it would you let me know how it turns out? Where can I find the Recipe for this meal ? ? More bowl recipes This is nice! This looks great and cant wait to try it. 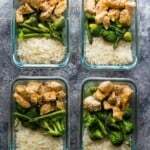 How much of each item (chicken, rice, vegetables) did you put into the containers? Thank you very much. Hi Andrew, thanks so much! I think it’s about 1/2 cup cooked rice per bowl, 1/2 of a large chicken breast was about 1/3 cup? And lots of veggies, 1.5 cups per bowl. This is an estimation 😉 I hope you enjoy it! How do you reheat the rice without is turning into a hard gritty crunchy mess? I can never reheat rice, even if I pour liquid into it first.. All I have at work to reheat with is a microwave..
Hi Christina! My rice never ends up crunchy…maybe because I use a rice cooker? With this recipe you will have some sauce on the rice so hopefully that will help too. What kind of rice you use? You can use whichever type of rice or grains you’d like. I use basmati. Use cauliflower rice instead. Far fewer carbs, and no crunchy rice problems. I would use Coco Aminos in place of the soy sauce. Healthier option. Just sprinkle a little water on the rice and have a lid loose over it when you microwave it. I also use a rice cooker which may help to start. Is it safe to microwave rice though?? I heard you can get food poisoning?? That is the only thing that is puttting me off right now!! If I am going to re-heat rice in the microwave, I dampen a paper towel and drape it over the dish. It acts a steamer and the rice comes out perfect! These bowls sound delish and I plan on making them! Thanks! Have you tried putting a moist paper towel on top of your rice container and heating it that way while adding some water directly on the rice? That should work. Or you may want to put the rice on a plate and push the rice to the edges of the plate and leave the middle of the plate empty and try not to put too much time on the microwave, start with 30 secs and put 15 more secs and so forth to get the desired heat. Hi Shanna, since I’m not a nutritionist, I’m not comfortable providing nutritional information for my recipes. You could always try a calculator like My Fitness Pal! You’re my make-ahead lunch guru, Denise, organised or not. The best thing about this is how easy it is. I’d love to see the ‘lunch envy’ you provoke when you take this to work! I love the look of your grain bowls! Especially this one!!! It sounds like you are organized with food though…I mean, these lunch bowls, YUM! I love the flavors of this chicken! Sounds perfect for an easy lunch! These are lunch goals!!! I’d happily eat these every day – so many great flavors! I need these lunch bowls in my life! Such a quick and easy way to ensure a healthy lunch on the go! I love it! Now this is a lunch bowl I can get into! LOVE the honey sesame flavors (and I’m pretty sure I can convince my kids to eat my veggies…;))!